Unity 3 is a powerful, full-featured game design tool, and it's free. (Some advanced features are reserved for the commercial Pro version). Unity is not a "learn to program games" tool, nor is it something designed to produce only small games with simple behaviors and effects. 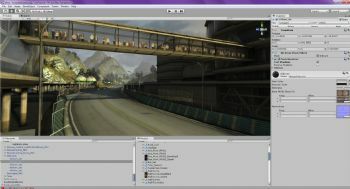 Unity can be, and is, used to make top-flight games including Tiger Woods PGA Tour Online and Batman: Streets of Gotham. Unity 3 is probably as easy to use as it can be (given how much fine control and detail is needed to make some types of games), but it is not going to let you go from "I have a really cool idea" to finished game with a few quick mouse clicks. It is best used by people who are already familiar with game design methodology and terms, as well as 3d graphics concepts including meshes, renderers, and textures. Great games require powerful, and complex, tools. Unity is one of them. The particulars of the interface as discussed in our review of version 2.6 have changed little. Version 3's improvements are less visible, consisting of major enhancements to the engine and to the target platforms supported with the commercial version (especially the iPad.) Even following Unity 3's tutorials, well-written though they are, can be a slow process, because there is a tremendous amount to review, click, set, or change in order to accomplish seemingly simple tasks. On the upside, much of the complexity is both hierarchical and copyable--that is, once you've built a very complex thing made of multiple nested sub-components, it's very easy to reuse 99% of the work to make something else merely by changing a few variables here and there. One important note: While Unity 3 is a great tool for assembling all the pieces for a game, it is not a tool for creating those pieces. Other than the sample files included for tutorials, you will need to create or buy the 3D models, textures, sounds, fonts, and other things which go into making a game. Maya is a high-end commercial choice for 3D modeling, and Poser is well known for creating human figures; freeware packages to look at include Art of Illusion and Daz Studio. Unity includes the NVidia PhysX engine, and includes such useful extras as advanced cloth rendering and animation, and even special models for wheels to better simulate the effects of traction in your racing games. The Pro version has even more features; you can see the version comparisons at the Unity license comparison page. Unity Pro starts at $1500.00, and for $400.00 more, you can also develop for iOS. As it's a free program, there's no reason not to download Unity 3 if you are interested in game design. That said, it is really only going to be useful for people who have the necessary background knowledge in 3D graphics, animation, and programming. Also, for all but the very simplest games, a team of developers is likely to be necessary.